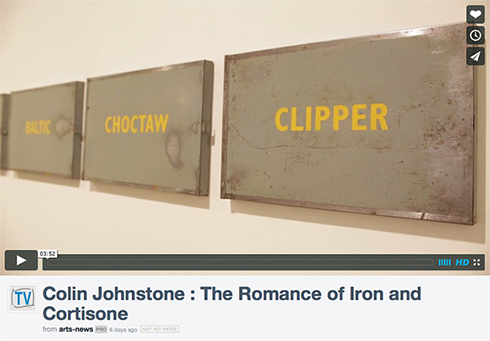 The Romance of Iron and Cortisone is Colin Johnstone’s second solo show at the Glasgow Print Studio, his first being in 1987. Johnstone worked at GPS from 1985-86 until he moved to Orkney where he now lives. Since graduating from Glasgow School of Art in 1982 he has exhibited widely including in London and New York. His last major solo exhibition was at the Pier Arts Centre, Stromness in 2008. A simple line in a notebook: “trying to figure out my father” was the catalyst for this current body of work. Drawing on his father’s occupation as a railwayman, Johnstone continues to make works that occupy a space between old and new, complete and incomplete, hand-made and multiple. There is both intimacy and distance here. Johnstone finds neutral territory and re-presents the images and objects that gaze back at us as we gaze at them. We look at them intently, comfortable in the known medium but curious as to the narrative that drives them. Colin Johnstone makes work that occupies a space between old and new, complete and incomplete, hand-made and multiple. There is both an intimacy and distance. Johnstone finds neutral territory and re-presents the images and objects that gaze back at us as we gaze at them. We look at them intently, comfortable in the known medium but curious as to the narrative that drives them. Image: Colin Johnstone, 'He Cells She Cells', text on aluminium panel.